Welcome to our humble "man cave" in Rocky Point conveniently located on Route 25A in the Business District where everybody is treated as a "good friend." If you need to wait, not to worry! You can watch a movie or play XBox 360 on one of our two large TVs. Or perhaps you would enjoy a game of pool on our pool table. 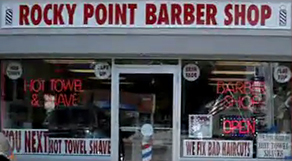 With haircuts at only $9.99, Rocky Point Barber Shop is your one stop shop for all of your barber needs. Here at Rocky Point Barber Shop, besides making you look good and "famous," we are looking to bring back a different age of barber shops — a friendly neighborhood meeting place where men can still receive shaves with the hot towel treatment.